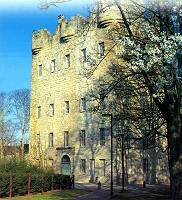 Alloa Tower, the largest surviving keep in Scotland, dates from the 14th century. It was home to successive generations of the Earls of Mar, who played host to and were guardians of many Scots monarchs. Here, Mary Queen of Scots was reconciled with Darnley and granted the 5th Lord Erskine the much-coveted earldom in 1565. One tradition holds that Mary's infant son, later James VI and I, died here and was replaced by the baby son of the Earl of Mar. The Tower has seen six major alterations, the most dramatic being the sweeping Italianate staircase and dome added in the early 1700s by the 6th Earl of Mar. But it still retains original medieval features such as the dungeon, first-floor well and magnificent roof timbers. Fully restored and furnished, the Tower contains a unique collection of family paintings by among others, Kneller, Raeburn and Alloa artist David Allan. On A907 in Alloa, Clackmannanshire.